The domesticated Crested Duck breed is a type of domestic duck breed of rather large size and weight with beautiful plumage. The Crested duck breed is distantly related to other ducks and is directly descended from the Mallard duck breed. 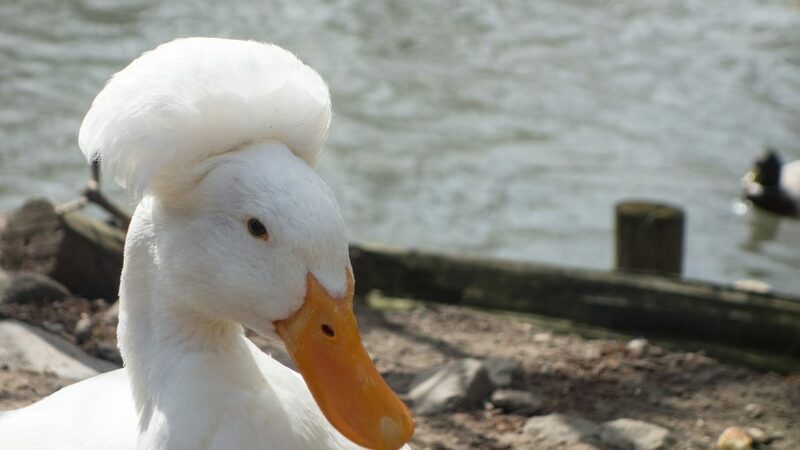 Crested Ducks have naturally-deformed skulls that give it a physical “crest” on the top of its head. Crests should be large and sit symmetrically on the duck’s head. The crest on Crested Ducks arose from a genetic mutation specifically bred into the bird by duck breeders. Interestingly enough, a quarter of all Crested Ducks die when they hatch because the crest is not properly formed and leaves the duckling’s brain fatally exposed. Another quarter of all Crested ducklings are born without a crest. Only half of all Crested ducklings hatched from eggs procured by breeding two Crested ducks will have the crested genes passed down to them. If a duck breeder breeds a Crested duck with a non-crested duck breed (such as a white Peking duck), the resulting ducklings will be evenly divided between crested and non-crested ducklings. Raising and Caring for Crested Ducks: Crested duck ducklings grow very rapidly and make excellent layers as well as meat ducks. Adult Crested ducks can weigh up to seven pounds! Crested ducks are easy to raise and are quite popular among backyard duck hobbyists, and can eat regular duck feed without modification. The United States Standard of Perfection (a poultry breed standard index) officially recognized two varieties of the Crested duck breed: Black Crested ducks and White Crested ducks. If you wish to raise Crested ducks by hatching duck eggs, you’ll be glad to know that it only takes 28 days to hatch the Crested duck’s eggs. Other information about hatching Crested duck eggs can be gathered in our hatching duck eggs article.